Radar from Raleigh, NC as of 9:00 PM EDT. 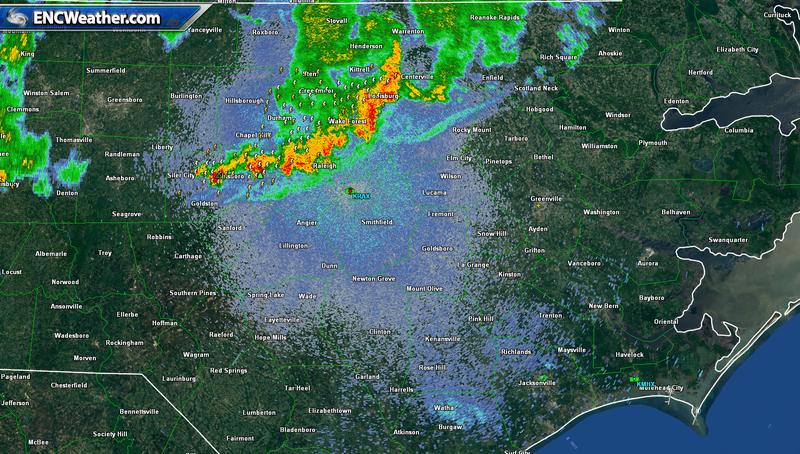 Current radar shows a line of showers and storms moving through the Raleigh area. These showers are being sustained by their outflow boundaries interacting with warm, moist air to the south. As the air stabilizes with the loss of daytime heating, these storms will begin to weaken and eventually die out. Some areas in the north and northwestern portions of ENC could see some rain before they die out but do not expect that they will make it too far east. Future radar shows rain decreasing later tonight with north and northwestern sections of ENC seeing some rain. Cold front to the north will continue to dig southward during the day Saturday. Some moderate instability will increase across the area during the afternoon. Some scattered thunderstorms are possible during the afternoon as the front continues southward. Expect showers and storms that do develop during the day to die soon after sunset. Temperatures should remain in the low to mid 80s inland with some variation along the coast where some locations could see temperatures in the upper 70s and other locations could be into the lower 80s depending on sky conditions early. 18Z NAM forecast for Saturday evening. The front will wash out south of the region Sunday though mostly cloudy skies look likely through the day. High pressure begins to nose in from the north keeping conditions mostly dry except for the slight chance for showers near the coast but chances are very small at this time. High temperatures will be held down to due cloud cover with highs mainly in the low to mid 70s across the region with some southern sections creeping into the upper 70s. 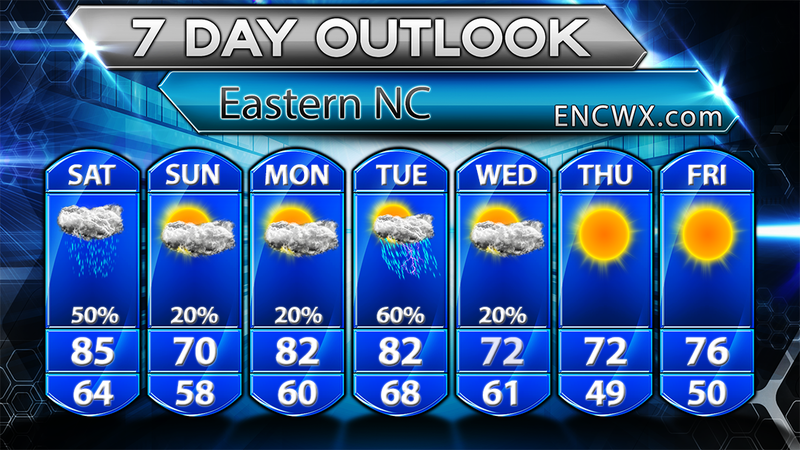 7 day forecast for ENC. Detailed weekly forecast will be posted Saturday. © 2019 ENC Weather. All rights reserved.